It's at this time of year as the rains roll in and the wind picks up that I go to my cupboard to assess my supply of dried fruit. In order to get through the winter months, I have tucked away dried apricots, figs, dates, cranberries and cherries. And while they aren't nearly as pleasing as fresh fruit, they still work their own magic in various pastries and desserts. For these little cakes, I soaked some dried cherries in port to soften them up. 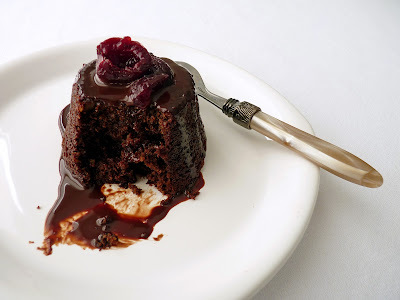 Then I plopped them into a very moist and simple chocolate cake that is a basic canvas for lots of things. In this case, I also added some ground nuts and dribbled some chocolate glaze on top to make them more festive. But they'd be just as good if you served them with a dollop of brandied whipped cream or a scoop of your favorite ice cream. A very quick and easy dessert to lend warmth to a chilly night. Cheers! - Soak the dried cherries in the port until they are softened, about 1/2 hour or so. - If you use almonds, the sliced variety are easier to get to a finer grind. - I baked these in 6 oz (3.75" diameter) tapered ramekins for 18 minutes. You can also use Pyrex custard cups or a standard cupcake pan. 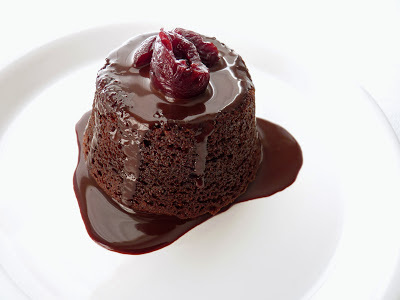 - For the chocolate glaze, chop the chocolate into fairly small bits to help it melt evenly and efficiently. 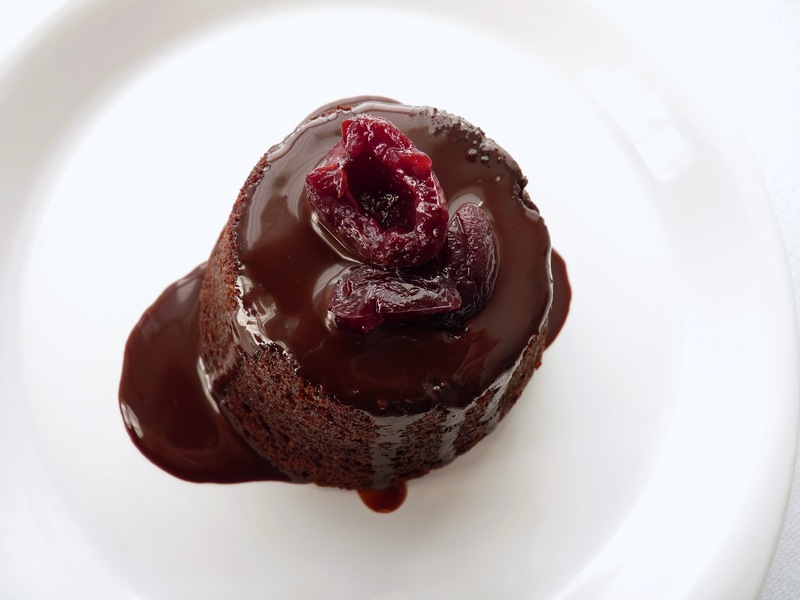 - Extra cakes can be stored in an airtight container and will stay moist for a couple of days. Preheat oven to 350 degrees. Lightly grease eight 6 oz ramekins or 8 wells in a standard cupcake pan. Roughly chop the dried cherries and plump them in the port until they are soft. Place the flour, nuts, baking soda, cinnamon and salt in the bowl of a food processor. Process until the nuts are finely ground. Stir the cocoa and warm water together until thoroughly blended. In a separate bowl, whisk the oil, sugars and egg and blend well. Add the cocoa mixture. Combine the milk and vanilla. Add the dry ingredients to the sugar-egg-cocoa mixture in 3 additions, alternating with the milk and beginning and ending with the dry ingredients. Stir in the cherries and port. Pour into prepared ramekins, filling each about 3/4 full. Bake until a tester comes out clean with just a couple of moist crumbs attached, about 18 minutes. Cool on a wire rack. Run a thin bladed knife around the edges to loosen and turn out the cakes. For the chocolate glaze, finely chop the chocolate. Heat the cream and corn syrup on low heat until it reaches a good simmer. Remove from heat, add vanilla and pour into a large measuring cup. Add the chopped chocolate and let it sit for about a minute. Stir slowly until fully combined. Let it cool for a few minutes to thicken. Plate the cakes and pour some chocolate glaze over the top of each. The popularity of Nutella is pretty staggering. But I have to confess, for someone who loves the combination of hazelnuts and chocolate - giandiua in Italian - I'd never tasted Nutella. In order to remedy that, I set off to make a cookie that incorporates it. Nutella was created in Italy in the 1940s by Pietro Ferrero, a confectioner who also later developed the tremendously popular Ferrero Rocher hazelnut chocolates. Since chocolate was in short supply at the time due to rationing, Nutella spread was made with cocoa rather than chocolate and that's how it's made today. Nutella was introduced to a broader market in the early 60s and the rest, as they say, is history. I've gotten into the habit of making cookies in my food processor, so this recipe is pretty quick to produce. The cookies are crunchy, crumbly and nutty. 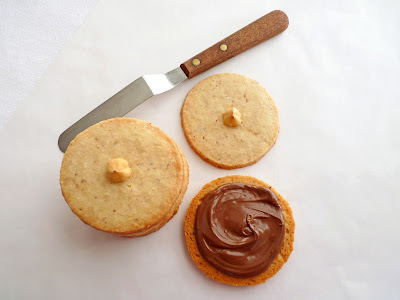 For a simple Hazelnut Sandie tea cookie, they're good served plain. But for something more adventurous, make them into sandwich cookies with a dollop of Nutella. - Toasting nuts brings out their oils and heightens their flavor. Toast hazelnuts in a single layer on a baking sheet in a 350 degree oven for about 8 - 10 minutes. Watch them closely as they will taste bitter if they are left too long. - I'm kind of a freak about chilling cookie dough to be sure the cookies hold their shape when baked. - If you prefer, roll the dough into logs. Chill until firm. Slice about 1/4" thick and bake. You'll get more cookies that are smaller in diameter. 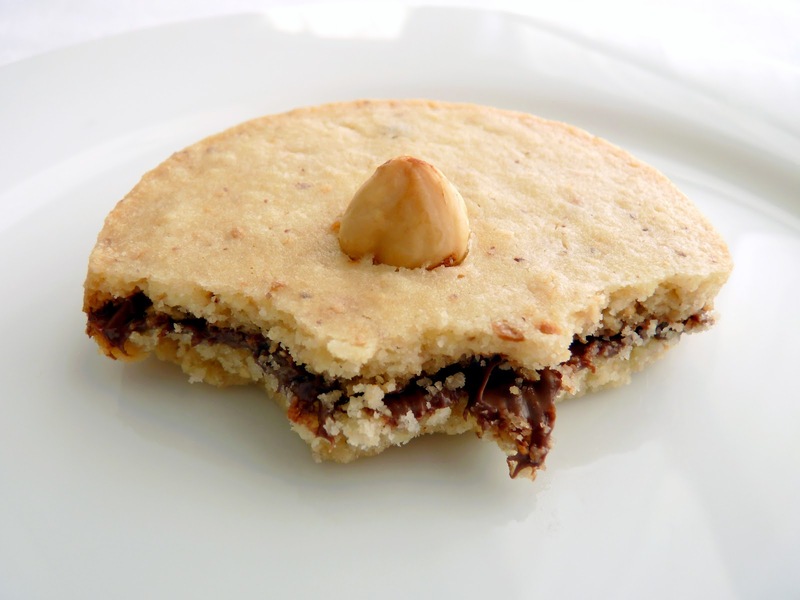 - Add an extra pinch of salt if you enjoy a salty nut cookie. - Although I didn't have any on hand, I was tempted to add a small dab of natural raspberry jam as well. Or, if you prefer, simply fill the cookies with about 4 oz chocolate melted with 2 oz of butter. Place flour, powdered sugar, toasted hazelnuts and salt in the bowl of a food processor. Process until the nuts are finely ground. Cut the cold butter into small 1/2" cubes and add to the flour and nut mixture. Process until the mixture looks like coarse meal, about 10 seconds. Combine the egg and vanilla and add. Process until the dough starts to form clumps around the center of the machine and holds together when pinched. 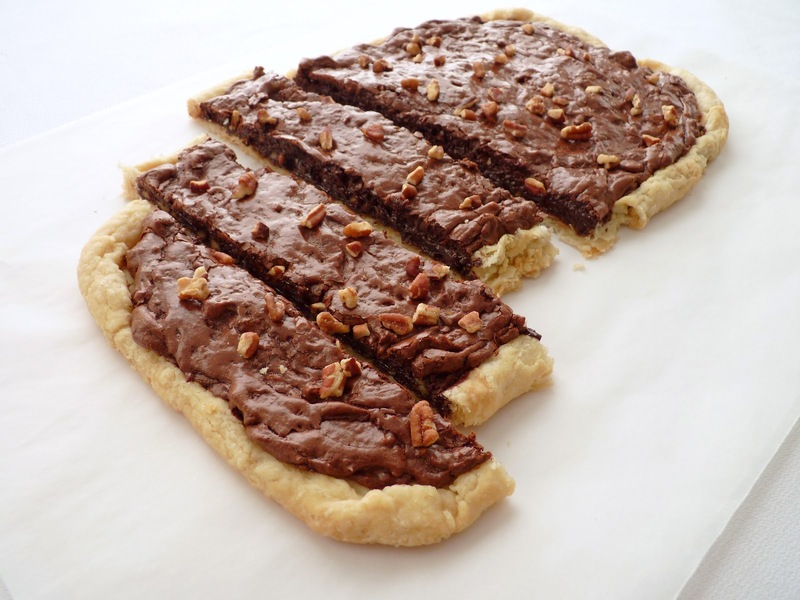 Divide the dough in half and place each portion on a piece of plastic wrap. Put another piece of plastic wrap over the top of each portion of dough and flatten into discs. Using a rolling pin, roll out each disc of dough between the two sheets of plastic wrap to a circle about 10" in diameter. Slide onto a baking sheet or pizza pan and chill thoroughly. Preheat oven to 350 degrees. Line baking sheets with parchment or silpats. Cut out cookies using a 2 1/2" cookie cutter. Gently re-roll scraps for additional cookies. Place 12 cookies per baking sheet. Press a whole hazelnut into half of the cookies. Bake until just lightly browned around the edges, 10 - 12 minutes. Place the pans on a wire rack to cool completely. 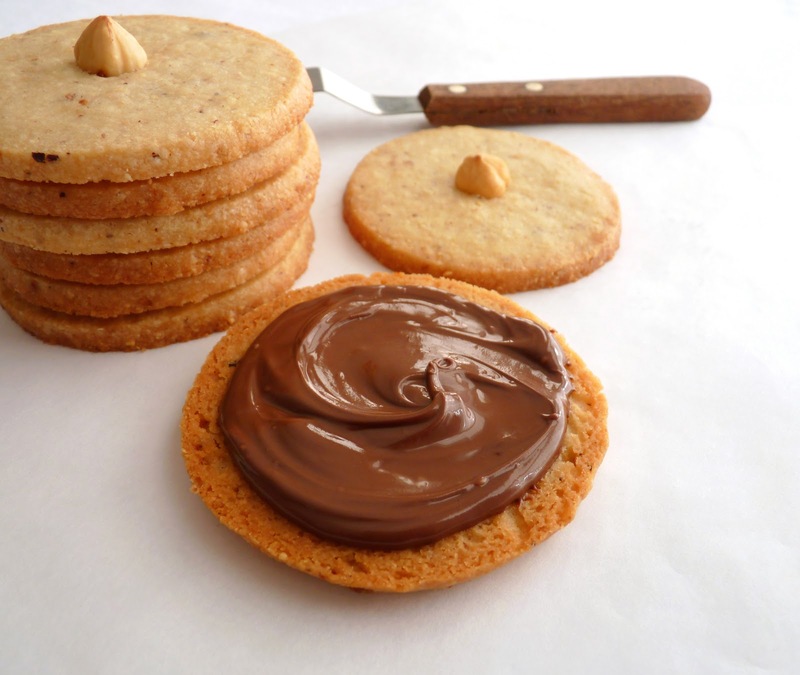 Spread a dollop of Nutella on the underside of half the cookies. Top with remaining halves. 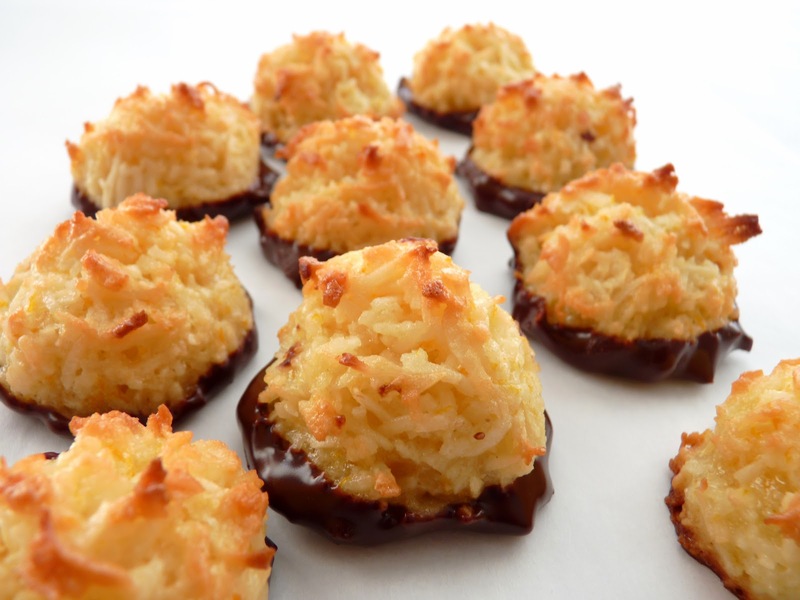 Coconut macaroons are an old standby, the gold standard sought out by coconut aficionados and found in countless bakeries just about anywhere. They are more than satisfying to those who love their chewy richness. 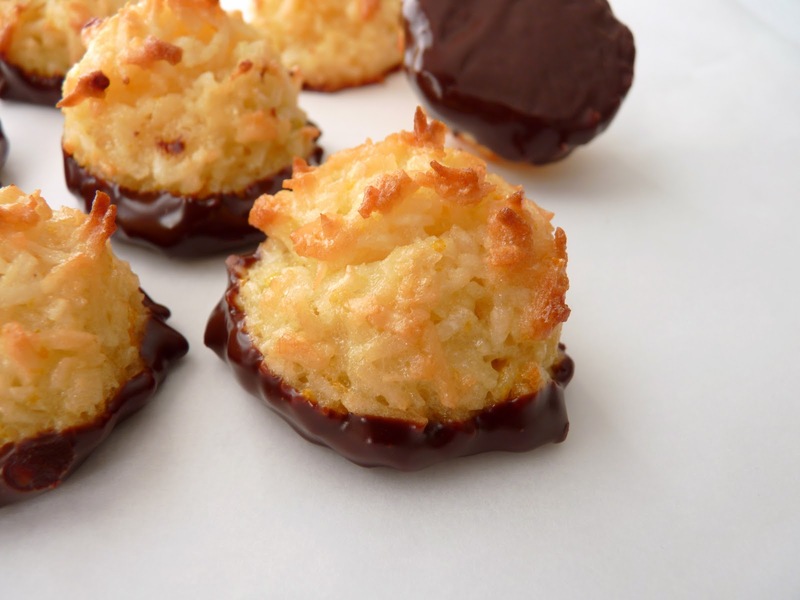 This is a basic recipe for coconut macaroons with just a little bit more. To add a note of citrus, I tossed in some orange zest along with lemon zest for backup. I also spiced it up ever so slightly with a smidgeon of cardamom. As the macaroons bake, the exterior gets toasty and caramelized and the interior remains moist and chewy. And then to give it a necessary dose of luxury that serves the season, I dipped the bottoms in chocolate. There are a few different methods to produce macaroons but I like to stick with the easiest. Simply combine all the ingredients together in one heatproof bowl. Then place the bowl on top of a pan of some barely simmering water. The mixture is cooked for about 5 minutes or so until it's thickened and dried out a bit. This cooking is to prevent the batter from slumping and forming puddles of liquid on the baking sheet, which burns and ruins the whole thing. If you're a coconut lover or happen to know one who might enjoy this cookie, this is one of those pastries you can whip up in very short order without a lot of muss or fuss or lots of equipment and dirty dishes. Although they're also good without the chocolate garnish, it balances the flavors and textures in an important and delicious way. - For this recipe, I use sweetened coconut because it's very easy for most people to find in their local grocery store. - To measure the coconut, I scoop it into the cup without packing it. - The standard weight for egg whites is 1 oz. If you have a stash in your refrigerator, weigh out 4 oz for this recipe. - I added just a pinch of cardamom, probably a very scant 1/8 teaspoon. You want just a hint of spice. - I used a small #40 cookie scoop to portion the batter. - These cookies are gluten free. 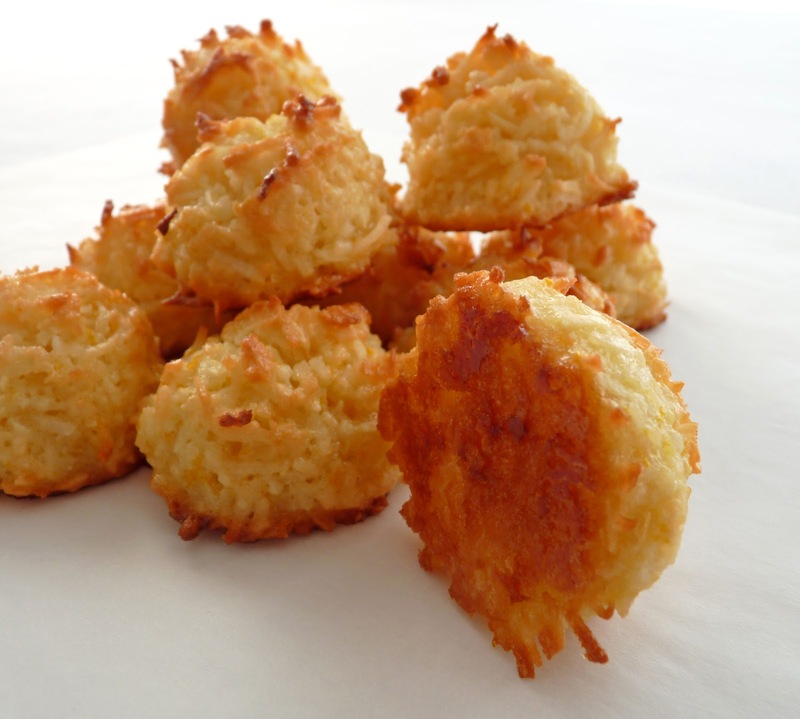 - Also try Pineapple Coconut Macaroons from David Lebovitz. Heat oven to 350 degrees. Prepare 2 baking sheets with parchment or silpats. Place the sugar, orange and lemon zest in the bowl of a food processor. Process until the zest is finely ground and releases its oils into the sugar. It will look orange in color and smell like citrus. Whisk together the sugar and citrus, egg whites, coconut, vanilla, salt and cardamom in a heatproof bowl and set it over a pan with a couple of inches of barely simmering water, making sure the bottom of the bowl isn't touching the water. Stir the mixture with a spoon or heatproof spatula, scraping the entire bowl to prevent scorching. Cook until thickened and the liquid has mostly been consolidated, about 5 - 6 minutes. The goal is to dry it out so it will hold its shape without slumping or making a puddle of liquid on the baking sheet. Scoop about 2 tablespoons into a ball and place 12 per cookie sheet. Bake until the edges and bottoms are golden brown, 13 - 15 minutes. Cool completely on a wire rack. You may need a small spatula to assist in removing them if they stick. Chop the chocolate into small pieces. Place the butter in a heatproof bowl and add the chocolate on top. Melt the butter and chocolate over a pan of barely simmering water, making sure the bottom of the bowl isn't touching the water. Whisk to thoroughly combine. Remove from heat and let it cool for a couple of minutes. Dip the bottoms of the macaroons in the chocolate, scraping the excess off the bottom against the side of the bowl. Set the macaroon on its side on a piece of parchment or a silpat to dry. Store in an airtight container between sheets of parchment or wax paper. 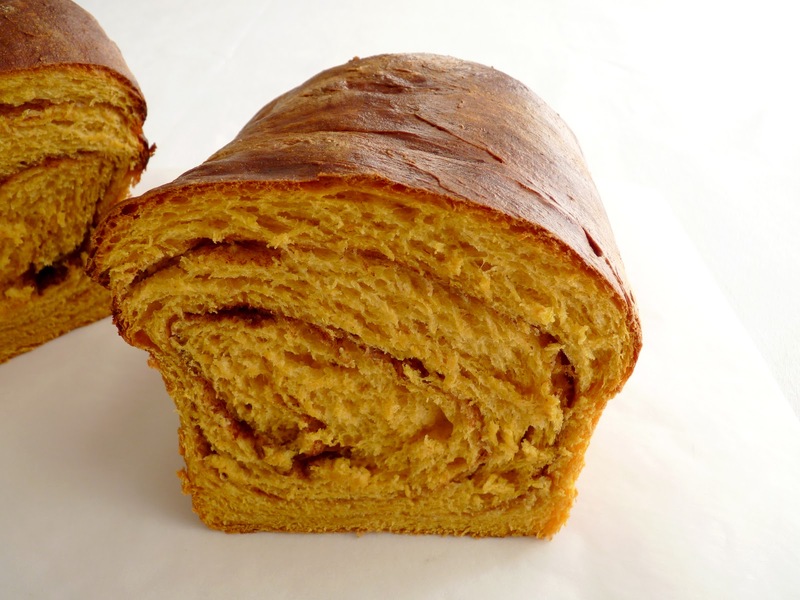 'Tis definitely the season for baked goods that celebrate pumpkin. With images of pumpkin pie, loaves of spicy pumpkin cake and pumpkin cheesecake dancing across our thoughts, the anticipation of enjoying the holidays is upon us! As you gather your own thoughts to plan your special treats for the holidays, consider making this very delicious yeast bread to grace your brunch or breakfast table. 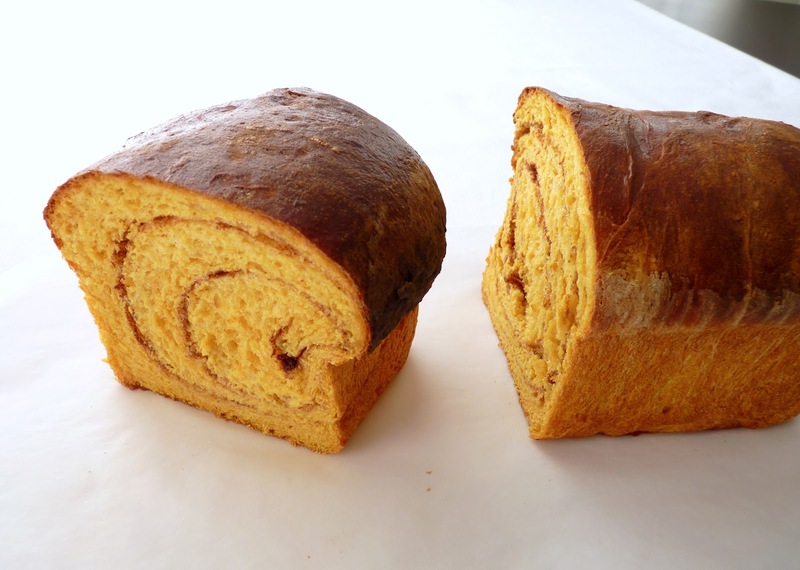 This is a recipe for Pumpkin Yeast Bread from the bakers at King Arthur flour. Although I love working with yeast, I have to confess this is the first recipe I've tried from them. I cut the recipe in half to make one loaf and I decided to add a cinnamon swirl for more flavor and visual interest. The result was a smashing success and I do highly recommend it to you for something fun and different. The dough is soft and supple and very easy to work with. It bakes off into a flavorful bread with a nice soft and chewy open crumb. 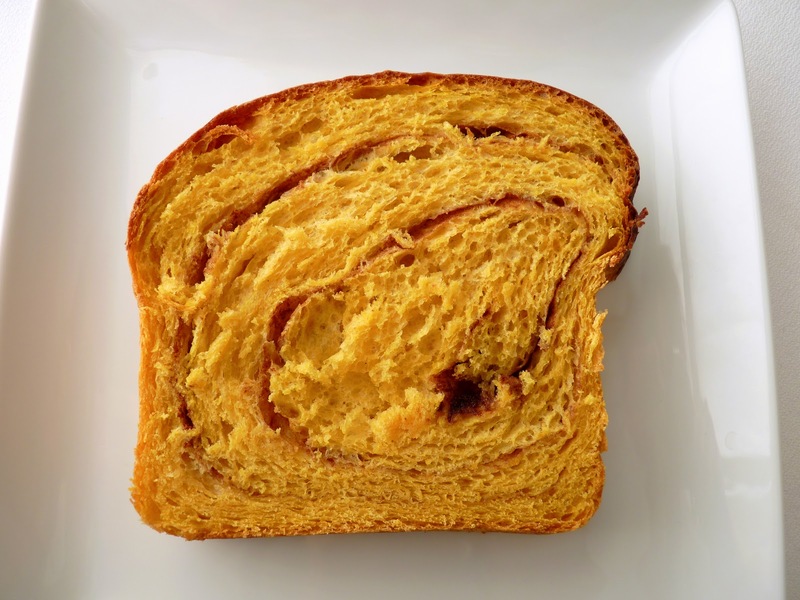 the cinnamon swirl adds just the right amount of sweetness and spice. In fact, you may want to consider making two loaves. 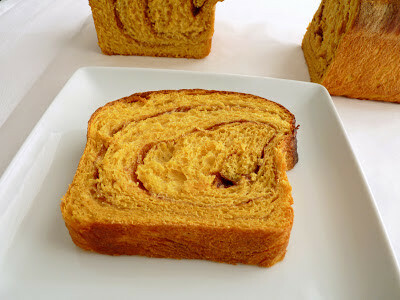 I think it would make a great slice of buttered toast or maybe as the star in a batch of French Toast. An extra loaf would also make a lovely gift for a friend or neighbor in need of a thoughtful gesture. So double the ingredients or follow the King Arthur link below for the full recipe. You'll have a very easy and festive seasonal bread and your kitchen will smell fantastic. OK, holiday revelers, it's on! - Both the water and the milk for the bread dough should feel warm (but not hot) to the touch. - I wound up using 3 cups + 2 tablespoons of flour in the mixing of the dough and another 1 tablespoon for the kneading. You'll also need just a light dusting of flour on the work surface when you roll it out. - I didn't really detect the ginger or the cardamom in the finished bread, so if you don't have those spices on hand, don't let that stop you from pressing ahead. - After you roll out the dough to the desired dimensions, brush the surface with egg wash before dusting with the cinnamon sugar. This helps to prevent separation and gaps in the swirl as it bakes. - Since I had extra egg wash, I brushed it on the top of the bread just before putting it in the oven. I also loosely tented a piece of foil over the bread after 15 minutes of baking. My bread baked in 25 minutes. - A serrated knife works best for slicing bread. - This bread will keep in an airtight container for about 3 days and still taste fresh and moist. - To use up any extra bits of pumpkin puree, try Pumpkin Pecan Madeleines. - One of my favorite pumpkin desserts for this time of year is Pumpkin Pecan Pie Squares, the best of both worlds. Place the warm water in a large bowl and sprinkle in the yeast. Stir and let sit for 2 - 3 minutes to soften. Add the warm milk, egg, pumpkin, oil, brown sugar, salt, ginger and cardamom and stir together until blended. Add 2 3/4 cups flour and combine thoroughly. Keep adding flour 2 tablespoons at a time, kneading until you have a smooth and elastic dough. Oil the bottom and sides of a clean bowl. Place the dough in the bowl and turn it over once to coat the entire ball of dough with oil. Cover with a piece of plastic wrap and set in a warm place to rise until doubled, about 1 hour. Lightly grease an 8 1/2" x 4 1/2" loaf pan. Combine the sugar and cinnamon and set aside. Combine the egg and water for the egg wash and set aside. When the dough has risen, press it down gently to release the gases. Turn the dough out onto a lightly floured work surface. Roll it out to a 17" x 10" rectangle. Brush the surface of the dough with egg wash (you'll only use a small portion.) Sprinkle the cinnamon and sugar evenly over the surface. Starting with the short end, roll the dough into a log. Pinch and press the ends and the seam to seal. Gently lift the log, seam side down, and place in the loaf pan, tucking the ends underneath. Set in a warm place for the second rise for 45 minutes. Preheat the oven to 375 degrees. Brush the top of the loaf with egg wash or oil if you want a shiny crust (check on it and tent the bread loosely with foil after 15 minutes, if needed). Bake for 25 - 30 minutes. Remove the bread from the oven and gently loosen it from the pan with a small spatula or a table knife. Turn the bread out of the pan and place on a wire rack to cool completely before slicing. 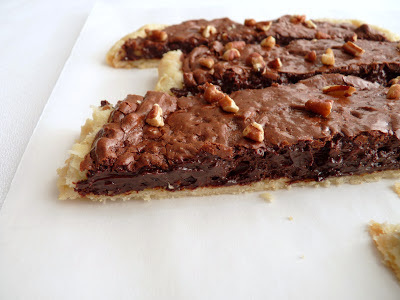 If you crave a good and unusual chocolate pastry, this is definitely one to add to your list of delicious things to bake. It's a recipe from Alice Medrich, so you know all the elements are in balance with plenty of deep chocolate buzz. But I have to say, it sort of defies description. 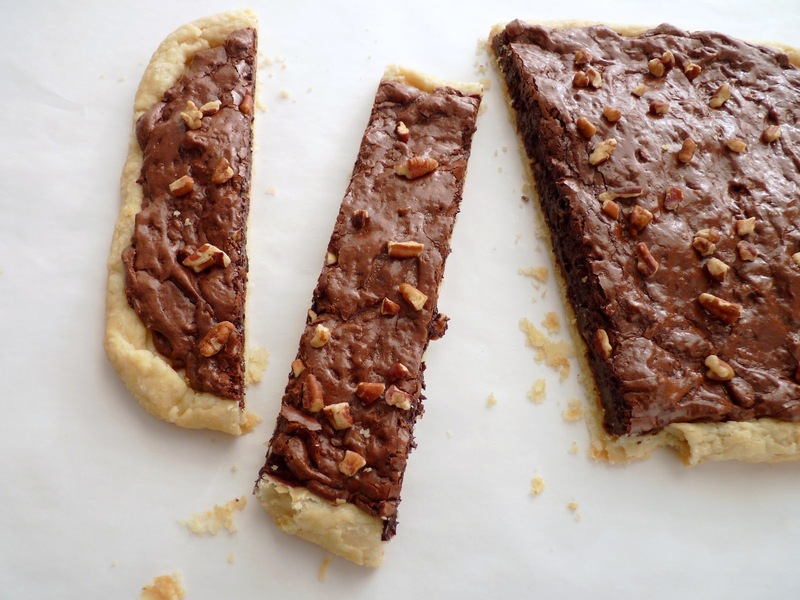 This "pie" is built upon a very buttery pastry. It's rolled out into a thin free-form base like a galette and it's very delicate and flaky. 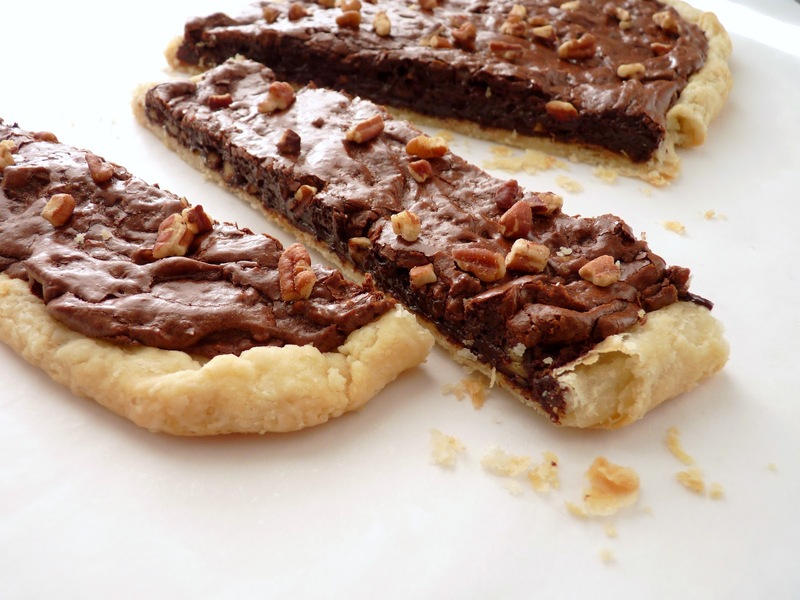 The filling is a billow of meringue folded into melted chocolate and nuts. Once baked, it's not dense like a truffle or brownie nor soft and airy like a mousse. It's gooey and rich without being too heavy. So it's a very offbeat sort of pie. In fact, it's not really a pie so much as a very simple but interesting composition of pastry, chocolate and nuts that's incredibly easy to compose and super delicious to consume. And it's fun to set it on your table and slice into it randomly and watch the crumbs fly. I'm sure you can find an occasion to celebrate the wonders of good chocolate sometime soon. This is a grand treat sure to elicit sighs of pure pleasure and good cheer. - The dough can be made ahead and stored in your refrigerator for 2 - 3 days. Any longer and it begins to oxidize and discolor. - I know a lot of people really fear working with pastry doughs. Handling dough can be trying if you don't have any practice. But just remember a few important tips: 1) Keep the butter and water very cold. As you mix, work quickly to make sure the butter doesn't warm up and get soft. Once the dough is mixed, chill it to relax the gluten, firm up the butter and allow the flour to absorb the moisture. 2) It may seem counterintuitive, but once the dough has been thoroughly chilled, you need to set it out and let it rest for a few minutes at room temperature to warm up enough to roll it out without a lot of resistance and cracking. So chill it thoroughly but then let it sit at room temperature to take the chill off. 3) Keep your work surface and the surface of the dough lightly floured as you roll it out. You don't want it to stick at all. After each roll, lift the dough to make sure it isn't sticking. Handle it gently and continue to dust with flour. This is important because I think this is where people begin to get discouraged. If the dough is sticking, it raises the possibility of tearing, which is very, very frustrating. So lift it often and keep it lightly dusted with flour. Once you've rolled it out to the desired shape and size, dust off any excess flour. I use a 3" wide paint brush with soft bristles. 4) If at any time the dough starts to get too soft, don't hesitate to return it to the refrigerator for a few minutes. It's important that it remain firm enough to handle without the butter getting warm and softening. 5) For ease of handling, I always roll out doughs on parchment paper. It makes it easier to form the pastry and then simply slide it onto a baking sheet without having to lift the dough and risk stretching, tearing or misshaping. Once you've made a few doughs with these tips in mind, you'll find your own zone with tarts, pies and galettes. It just takes some practice to get the feel for the right temperatures and a light touch. - There's a good ratio of butter in this dough but oddly it doesn't take on much browning at all even though it's pre-baked at 400 degrees. The temperature gets lowered to 350 degrees once the filling is added but it only bakes for 10 additional minutes. - I used a mix of 4 oz of semisweet chocolate and 2 oz of bittersweet. Alice Medrich suggests either bittersweet or semisweet but also says the chocolate you choose shouldn't exceed 62%. - Egg whites are 1 oz each so if you have a stash, weigh out 2 oz. - Nuts are definitely important for texture and flavor. - Bake for just 10 minutes so the interior is gooey. The surface should look dry and a bit shiny and may look slightly cracked in places but still have a soft interior. - The recipe suggests 3 tablespoons of toasted pine nuts and chocolate shavings as optional garnishes. I just used a portion of the same nuts I folded into the filling. For the crust, toss together the flour and salt. Cut the cold butter into small pieces and add to the flour, tossing to coat the butter thoroughly. With a pastry blender or your fingers, incorporate the butter into the flour until you have some larger pieces the size of pine nuts and smaller pieces that resemble coarse bread crumbs. Don't let the butter get too soft or blend completely into the flour. Drizzle the cold water over the flour mixture. Toss and mix just until moist enough to hold together when pressed. Turn out onto a piece of plastic wrap. Gather and consolidate the dough into a flat disc. Wrap and refrigerate 30 minutes or up to 3 days. Unwrap the pastry dough and place on a floured piece of parchment or work surface. Let it sit for a few minutes at room temperature until pliable enough to roll without cracking. Roll the dough out to a 14" x 9" oval about an 1/8" thick. Brush off excess flour. If you didn't roll it out on parchment, fold the dough in half to transfer to a baking sheet lined with parchment or a silpat. Unfold the dough and loosely roll up the edges to form a rimmed crust without pinching or pressing too firmly. Bake 10 - 12 minutes or until you see some browning. The crust edge will still be a little raw inside. Place on a wire rack. For the filling, chop the chocolate into small pieces and place in a heatproof bowl. Place the bowl on top of a pan of barely simmering shallow water, making sure the bottom of the bowl isn't touching the water. Stir until the chocolate is melted. Remove from heat and set aside. Beat egg whites with cream of tartar until opaque and soft peaks form. Gradually add sugar and salt. Beat until the whites form stiff peaks that are not dry, adding the vanilla in the last few seconds. Fold the whipped egg whites into the melted chocolate until it is nearly blended. Add the nuts and fold until there are no streaks. Dollop the filling onto the baked crust and spread evenly to the edges. Bake for 10 minutes. Cool on a wire rack. Garnish the top with extra nuts and serve warm or cool.